I've owned this book nearly since I was born. When I got married, I scrounged through boxes in my parents' garage to salvage it from donation, because I have such fond meories of it from my childhood. 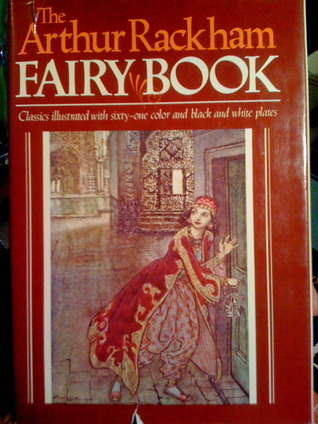 It's a lovely book of 23 classic (and not-so) fairy tales, illustrated beautifully both in color and in black and white. I do believe there were one or two fairy tales that I hadn't read before, (or perhaps it's just been a long time since I've heard them) but the main reason I borrowed this collection of fairy tales was to admire Arthur Rackham's illustrations, and his coloured illustrations in particular did not disappoint. Good number from Perrault, Hans Christian Anderson, and selections from The Arabian Nights. There are a couple other sources. I'd read a number of these before, but not with the benefit of Rackam's engrossing illustrations. He draws really big feet, I noticed. I enjoyed this collection. This is as good as it gets! The illustrations by Rackham are enchanting, and so are the stories by Grimm, Hans Christian Anderson, Perrault, the Arabian Knights. Dear cats and kittens, this book made me unspeakably happy.